Reflections upon China “…And now, you can give it to others…” | Realise the World! 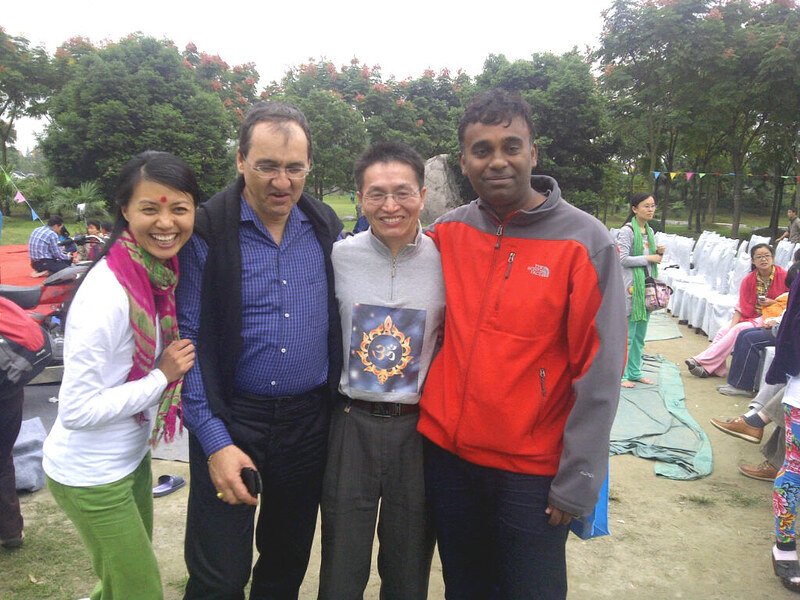 Reflections upon China Tour from Anand Varma (far right in picture). Anand is Shri Mataji’s Grandson. The same has been repeated over 3 decades of talks and hailed by Mother when achieved. What we saw in China had my eyes well up repeatedly. It was really quite unbelievable and not only for what we were seeing but for what we were experiencing internally. I had landed on the tour with a heavy heart and an anxious mind. I left uplifted, smiling, content, confident, thoughtless and full of spirit. I can only reiterate the delirious joy expressed by Chris below, upon seeing the humility, devotion and conviction of the Chinese Yogis, Pollyanna’s in their own right. Bereft of politics, complexes and dissatisfaction , they simply stride ahead with dynamism, magnanimity, generosity and decorum. All together it has left me speechless. I could not believe the beauty and protocol with which some of the Altars were decorated. The way Pujas were conducted and the spirit with which each Yogi came forward to be part of the process. Not seeking attention, or a special place, just diving into the joy and making it an experience of their own. During an early morning meditation in Chengdu, I felt my heart open and my spirit soar to a peace and satisfaction that was like the balm of vibrations around Mother, one felt like a child, cuddled and held by soft arms and left feeling invincible. These experiences continued through the tour affirming in a way that Mother was pleased and she had blessed this collective effort. Alex has been instrumental in this achievement and has done it with great humility and regard for all. I have no words to express my gratitude towards him as a member of Mother’s family. He will himself experience the Punyas of being such a devoted Bhakta. You cannot replace the joy of a collective effort on the ground, just being part of the action…. The Music of Joy…..what can I say. I could see the intensity with which these Bhaktas played, sang, lifted instruments , and clapped with all their heart and soul. Whether it was Rishi who was holding the rhythm, John who was leading the sound or Jean-Michel clanging a simple Indian cymbal, each one was pouring their hearts out in devotion …… Touring 9 concerts in 16 days was exceptional. I guess, It is only when one experiences the true Bhakti in a collective form such as this Tour, that one enhances and understand the edges of our evolution, and how we can raise the bar of getting close and deeper in surrendering in Mother’s love. These are the moments we can replay in our minds, when having a coffee, or staring at a blank ceiling in bed , sick, tired or at the beach, these are the moments which will really matter , where God is served and pleased and you are please and content being part of it. It is such a beautiful piece that has been written and helps us understand more.